I’ve earned $348.28 since joining in 2007, and am awaiting a “big fat check” for $79.22. A client asked me for some advice on where to buy acrylic frames for the silent auction displays. In our local Washington, D.C. area, the cheapest I’ve seen has been at the Super Dollar store where 8.5″ x 11″ frames were selling for $1.25. But I also did a quick search online and was pretty pleased when I could refer her to Absolute Acrylic, which priced the frames under $3.50 each. That purchase resulted in a savings to her school of well over $100! Another tip: If you’re shopping for silent auction supplies and items online (maybe themed decor, utensils, etc. 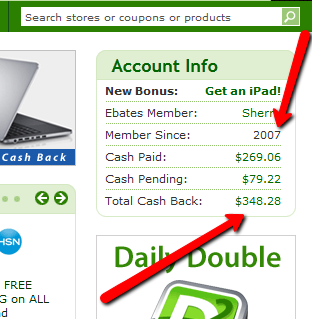 ), consider joining eBates. There’s no fee to join, and they offer additional modest discounts on many products from online retailers. My advice is to comparison shop online … find the best deal you can … and then log onto eBates and see if that store is represented in the company’s line-up. If so, log into eBates with your account and enter the retailer through the eBates site in order to buy your merchandise via the eBates discounted system. I’ve had additional discounts ranging from 1% – 15% in savings. What I also love is that this discount is an additional savings beyond whatever you might have already secured. For instance, you might have found a great price for centerpieces at Retailer XYZ. Then you did a search and found an online promotional code for $20 off those centerpieces. Then because you entered Retailer XYZ through eBates, you will automatically receive another discount in addition to your $20 coupont. To be clear, the eBates discount won’t reduce your shopping cart total at the point of purchase. Instead, your savings will show up in the form of a check — a Big Fat Check, they call it — in your mailbox the following quarter. I love it! I’m constantly surprised at how many of the online retailers (and brick-and-mortar companies) I use are affiliated with eBates. It’s a great way to save money. Though I’ve never checked, maybe they have an affiliation with a company selling acrylic frames. Then you could buy them at discount — and still get a Big Fat Check — for your next silent auction.